Its sunny today. yay! for the first time in 10 days.. Its not meant to last til the weekend so Im gonna go sit in the garden & enjoy the rays..
all H&M, Triangle ring: DP, Necklace c/o Elsie Belle. Glasses: Specsavers. I saw this top pop on Asos 'New In' a month or two back & it sold out before I got the chance to buy it. Luckily it came back into stock and I snapped it up instantly. Ive been wearing it mainly with denims. Pastel jeans & this denim skirt. Im expanding my denim collection and want a fitted light weight denim shirt, I had one from River Island but split tomato soup all down it. Typical of me really. So now its ruined. Anyone seen any nice denim shirts anywhere they would recommend? you look so super skirt :) i love the shoes and skirt! That bag is lush, is it really from accessorise?! I love your top - so cute! I love the print on that top, and I have an ongoing obsession with your glasses. Completely in love with this outfit! looks like you and me had a similar day in terms of photos and weather! hee hee. iCE CREAM print top is to die for! In fact, your whole outfit is super cute! Such a pretty outfit, that top is amazing! You could try looking for pastel color jeans to match one of the colors on your shirt . I am in love with this outfit! It is so pretty - I love the blouse! Gorgeous gorgeous outfit!! Everything you wear is so pretty!! Love the top, so pretty! Your bag is amazing too! I have a really nice denim top from Topshop, but I got it last year. They might still have similar ones though, but I didnt see any when I was last in there. Sorry honey! LOVE your blog header and pugs. This is ADORABLE. I love the bow. And your skirt. It's just downright perfect. What a gorgeous pastel outfit! That top is lovely on you! 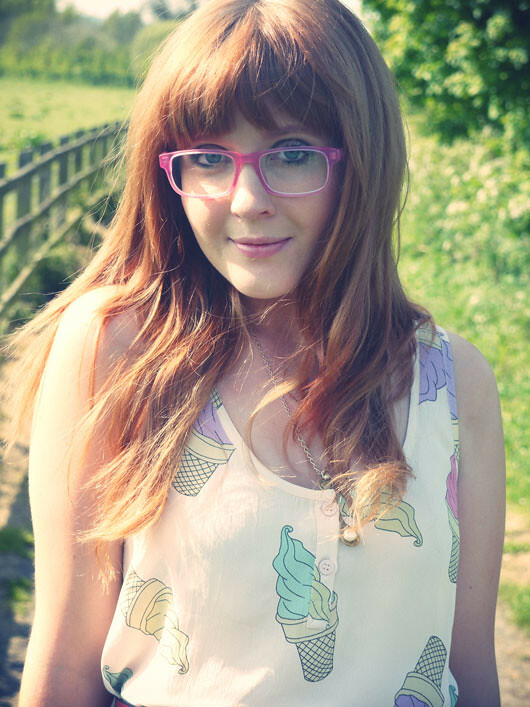 I've got my eye on an ice-cream print top, have spied one in Motel but that ASOS one tops it! I adore that top, such a pretty print! Thats a really pretty top and it look great with denims indeed :) This is such a sweet outfit! I really miss shopping in Scotland! I lived in Glasgow for awhile and I loved everything they had in the stores. This was way before Topshop moved to the states. Looking at all your pretty clothes makes me jealous! Your outfit is quite literally delicious! I love your ice-cream cones! Perfect for summer! You can try J-crew for chambray shirts. They have been making some really nice ones.. and comfortable too. i tend to get my denim shorts from either gap, banana, or j. crew; they have longer, more elegant cuts that are more sophisticated, less booty shaking than most other shops. Wow this top is so stunning I love how you've styled it! omg its so gorgeous ! Just come across your blog it's great! We have a fab vintage shirt ending in our capsule vintage range tomorrow you may like! your vest is really cute and i love your bag! the colours and shape are both really lovely. Love the Ice Cream Cones! I feel like I'm always spilling things on my clothes, or ruining them somehow, so frustrating! I'm having major glasses-envy right now... those pink ones are amazing! This is a really cute outfit & I love that setting you're in! Aw this is so cute and summery! I love the bow belt paired with your denim skirt. This reminded me that I thrifted a denim button-down skirt a little bit ago and still haven't worn it. That needs to be remedied!